Providing static sealing between the outer diameter of the seal and its housing. 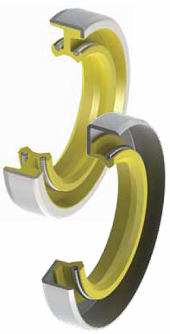 Sealing between the shaft and the main sealing lip when either static or dynamic. The radial load exerted by the sealing lip must be sufficient to retain the oil or grease, but not so high that excessive friction losses or wear occurs. The principal of this can be affected by the following basic parameters and must always be taken into consideration when selecting the correct profile and material to enable the optimum performance.